On 23 April 1616 Shakespeare died; he was fifty-two. Not surprisingly, his plays have been translated into every major living language and are performed more often than those of any other playwright. Controversy has lingered over the authenticity of some of his works. I decided to play (!) with this idea for a science fiction story, ‘If We Shadows Have Offended’, which can be found in the collection Nourish a Blind Life (2017). He smiled at his great ancestor’s photograph. In 1895 WG Zeigler, a Californian lawyer, had been the first to suggest that Christopher Marlowe’s death on 30 May 1593 was staged and that the poet actually went underground to write the plays using Shakespeare’s name. In the greying mackerel sky, the sinking sun streamed red down onto the white concrete square building with a circular tower, similar in style to the old-fashioned long superseded light-houses. Above the tower hovered a shimmering black cloud. But this was no ordinary cloud. It hung perpetually over the tower, possessing no depth or discernible edge. Gleaming. Apparently as fathomless as the deeps of the oceans. One of several Timedoors into the past. 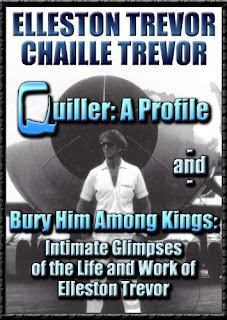 Zeigler had frequently passed this and other Timedoors, and on each occasion he had been drawn by the weird unearthly sight of those black clouds. Such awesome power, so frightening to contemplate, and now he was destined to travel through one. Zeigler read the small red print alongside the doorway. He was to give his name, age, occupation, ID number, and his appointment reference number. Making sure he got it in the right order, he complied. The door opened upwards with a hiss. The interior was blank metallic walls on three sides bathed in glowing red light. By then of course they might be virtually deaf - his nephew’s hearing was 30% poorer than his, and the lad was average for his age. The door glissaded shut behind him. The pitch of humming heightened. If the slight upsurge of his entrails was anything to go by, he was rising in a remarkable lift - no, there was no lift cubicle: he was rising bodily up a shaft, probably in some kind of anti-gravity beam. The instructions had been unable to prepare him for anything like this, doubtless for security reasons. Markers on the walls showed his ascent. At the fifty-foot mark he stopped with a queasy reaction in his stomach. An opening appeared in front of him and he stepped into a brightly lit circular room, the walls crammed with computer facia and attendant hardware. Seated at a tubular steel desk, a young beardless man in a white smock beckoned for Zeigler to step forward. ‘You are on time, Mr Zeigler - a trait sadly lacking these days!’ The man shoved across a quarto printed sheet. ‘Please read this and sign. It is the Official Secrets Codicil (TPC) 2058. Afterwhich, kindly enter that stall over there.’ He pointed to a recess in the wall, between two orange steel computer cabinets. The cubicle was uncomfortably narrow. A flash appeared in front of his eyes. It felt as though his eyelashes had been seared off. But it was over so fast he remained unmoved. Although very curious as to why the box was being secured over the fleshy bulge of his left shoulder blade, Zeigler scanned the pages of small print. It appeared that the device would self-destruct should he do anything to disturb the balance in the past. By self-destructing, it would also take him with it, leaving no trace whatsoever. Then the Timedoor would close on his ashes and the pod would disintegrate. Zeigler was lifted up another anti-gravity beam. ‘Enjoy your trip!’ called the young attendant. Again, Zeigler rose but this time it was a green zone: olive and yellowish. Quite sickly. Finding himself in another room devoid of furniture or machinery, he was startled to hear a metallic female voice issuing from a grille. The speaker unit clicked off and a tray levered out from the wall with his pile of Elizabethan clothes lying on its shiny surface. He blushed; another first-impression destroyed: I thought her as chaste as unsunn’d snow - Cymbeline. He sighed. It was like a velvety blue-black, with pinpoints all around, like stars that had forgotten how to twinkle. The sensation of movement had stopped - how long ago? He had no way of knowing, there were no instruments or clocks in here; and his wristwatch had been removed, together with every other personal possession. Walsingham had contrived a most corrupt system of espionage at home and abroad, enabling him to reveal the Babington plot which implicated Mary Queen of Scots in treason, and to obtain in 1587 details of some plans for the Spanish armada. Queen Elizabeth I acknowledged his genius and important services, yet she kept him poor and without honours, and he died in poverty and debt in 1590. At least he seemed to live longer than Marlowe. At the age of twenty-one, Marlowe was employed as an agent provocateur, posing as a Catholic to spy on other Catholics, and acted as a renegade to trap such people. Hoffman believed Marlowe settled on the Continent and continued to write and sent his manuscripts to Walsingham, who had found a reliable if dull-witted actor fellow, William Shakespeare, ready - for a stipend - to lend his name as the author of Marlowe’s works. Shakespeare databases were built as early as 1969 on an ICL machine, the KDF-9. Since then, ICL’s Content Addressable File Store - Information Search Processing and Oxford’s Concordance Program, written in Ansi Fortran had been used to word-count and create concordances, ostensibly to facilitate research. The DEC VAX 11/70 computer research gave credit to Shakespeare for Acts Four and Five of Pericles but not Acts One and Two; the researcher or computer never mentioned Act Three! Zeigler wondered if Shakespeare waited still, far off on some heavenly hill, wondering if his detractors would ever cease pursuing him. Poor Will, thought Zeigler. Well, the Timedoor Committee evidently felt the Zeigler theory had sufficient merit for them to accept his research request. And now he was almost there! He didn’t recall passing through the hole or landing. Perhaps he simply materialised? Darkness. Raised jaunty voices. The rank stench of open sewers. These were his first impressions. It was night. He looked around and discovered he was still lying in the pod amidst a grove of bushes. He checked the two console buttons. Red for his return signal. Green for opening the pod. Another button, on the reverse of his eye-pendant, worked the pod’s entrance-hatch for ingress. Zeigler operated the green button and no sooner had he stepped out than the hatch shut behind him. As he walked a few paces out of the bushes, he glanced back and was surprised to find he could no longer see the pod; its see-through capabilities aided concealment: someone would have to virtually stumble over it to discover the craft’s presence. He didn’t have far to walk before he came to the town with its tumbled toppling street, black and white timber awry, cobbles threatening to pitch him every which way. Cats fought for thrown out fish-heads and other unidentifiable scraps. Zeigler felt very vulnerable strolling the streets, for in these times no man was safe from the reach of the torturer or the smell of the dungeon. A carrion odour blew towards him and he retched emptily: ahead he noticed the swaying hanging remnants of a human being; some of the hideous butchery on the scaffold was sufficient even to turn the stomach of an Elizabethan crowd. A building belched forth the soul of an alehouse but, gagging on the riot of smells, he passed it by. He needed to find Mistress Turner’s lodging house, up a squeeze-gut alley. The full story was published in my blog on 23 April and 24 April 2016 on the 400th anniversary of Shakespeare's death. 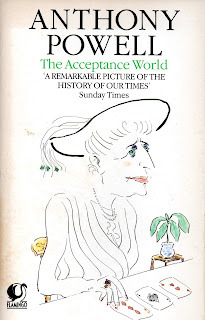 Third in Anthony Powell’s 12-volume novel, The Acceptance World was published in 1955, three years after his previous book in the series. I’m finding it fascinating that he kept his readership despite the long periods between books. It’s as if the characters he wrote about lingered in the memory like real people, as if the reader knew them. The special intimacy of first person narrative would help in this regard. One acquaintance of Nick’s is the novelist St. John Clarke. Unlike we struggling authors, it appears that his ‘sales did not depend on favourable reviews, although, in spite of this, he was said to be – like so many financially successful writers – painfully sensitive to hostile criticism.’ (p29) Nick’s old school friend Manners was the novelist’s secretary. Their group at the Templers’ is increased with the arrival of Quiggin, making up an ‘oddly assorted company’ (p91). After dinner, they indulge in an Ouija session, which turns awkward when Marxist sentiment intrudes in the esoteric messages! Some days later Nick and Jean witness a ‘hunger march’ joined by St. John Clarke in a wheelchair accompanied by Quiggin and Mona Templer, the harbinger of a collapsed marriage. Nick learns of a number of marriages disintegrate and there’s a strong whiff of betrayal and dissatisfaction with women. The reunion throws in the fact that one old boy had given a maiden speech in parliament, ‘tearing Ramsay MacDonald into shreds’, while another talked of India’s eventual independence, and another talked of Tanganyika. In short, the orbit these old boys covered encompassed the world painted pink. ‘I haven’t got my own good at heart,’ says Stringham. Despite the mention of the abandonment of the Gold Standard, the formation of the National Government, and the other references above, there was in my view little feeling for the period. Certainly, Marxism was raising its head – no doubt in the background, recruiting spies in the University cities. But I’ve still to perceive ‘a remarkable picture of the history of our times’ as espoused by the Sunday Times blurb. Maybe that will come after a few more books. This is not a criticism of the books, naturally, but of the blurb writers! 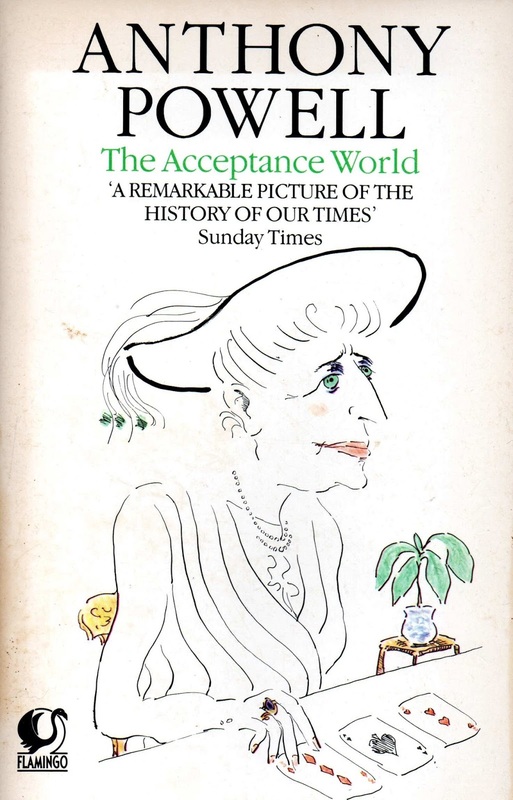 The cover sketch by Mark Boxer shows Mrs Erdleigh. When Nick witnesses a demonstration, he merely states: ‘a banner upon which was inscribed the purpose and location of the gathering.’ Why didn’t Powell write what the banner said? This is not good visual narrative. He describes the Italian Foppa with his ‘tiny feet encased in excruciatingly tight shoes…’ (p153) They might look tight, but Nick couldn’t know they were excruciating.